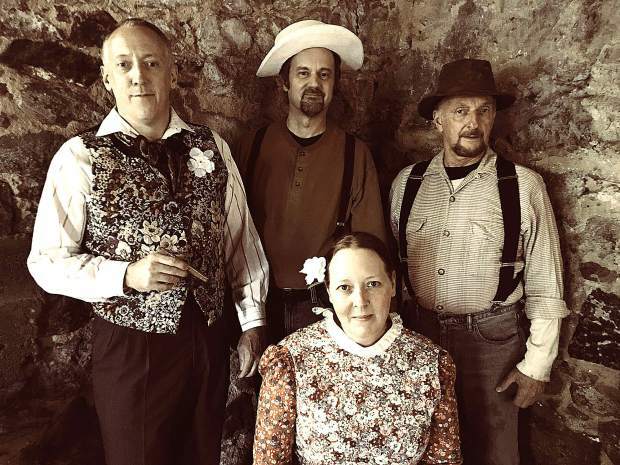 From left to right: John Gardiner, Paul Micsan, Bruce Kelly, and seated is Shawnna Frazer. The four actors will play out stories from Bret Harte as part of Tim O'Connor's Readers Theatre. Tim O’Connor’s Readers Theatre returns to the Miners Foundry Cultural Center, Sunday, with a special program celebrating the short stories of famed gold rush-era writer Bret Harte, as read by local actors Shawnna Frazer, Bruce Kelly, Paul Micsan, and John Gardiner, and directed by Gaylie Bell-Stewart. Founded by O’Connor, Readers Theatre has been called many things including “Theatre of the Mind” and “Story Time for Grown Ups,” and gained popularity during World War II when large stage plays were too expensive to produce. Using minimal props, the actor and your imagination illustrate the story. Harte was the first American writer from the West Coast to gain an international reputation and was instrumental in introducing frontier literature to eastern audiences. His stories established many of the basic characteristics of the western genre: rough, sarcastic humor, rustic dialect, and character types such as good-natured gamblers, greedy bankers, and prostitutes with hearts of gold. His literary fame was brief, lasting less than a decade, but it helped make possible the success of other frontier writers, including Ambrose Bierce, Robert Newell (Orpheus C. Kerr), Charles Farrar Browne (Artemus Ward), and Samuel Langhorne Clemens (Mark Twain). “His writing spelled the beginning of the end of the Old Guard, the gentile elite, who looked to Europe for influence and began a new, rejuvenated American style of writing,” said Bell-Stewart. Sunday night’s featured shorts stories include “The Luck of Roaring Camp,” Harte’s most popular story and the one that brought him to international fame. In it his colorful, crude dialogue was something brand new at the time. In “The Idyl of Red Gulch,” Harte explores the idealized perfection of womanhood in the mid-1800s. “Tennessee’s Partner” is a fine example of a Western local-color tall tale and one of the earliest “buddy stories” in American fiction. And finally, “The Stolen Cigar Case” is a parody of a Sherlock Holmes story (Ellery Queen named it the best parody ever written), and a great example of Harte’s talent and sense of humor. Accompanying the evening will be live music featuring songs of the era. Readers Theatre is a fundraiser for the historic Miners Foundry Cultural Center.